I had big plans for my blog this week until I woke up Sunday morning feeling dreadful with the return of a cold which has lingered until now. Instead my day of blog writing was spent feeling very sorry for myself on the sofa armed with tissues and Beechams tablets. Thankfully today I’m feeling much better so it’s back to business starting with my overdue outfit post following Saturday’s family BBQ (read more here). Firstly sorry for the creasing on my dress, fashion blogger I am not and these photos were taken on the way home after indulging in far too many burgers. Aside from the creasing this dress was a big hit and it was comfortable enough to accommodate an afternoon of eating. More importantly I can’t believe I survived the party without dropping a smidgen of ketchup down me!. The shoes alas were not so comfortable. 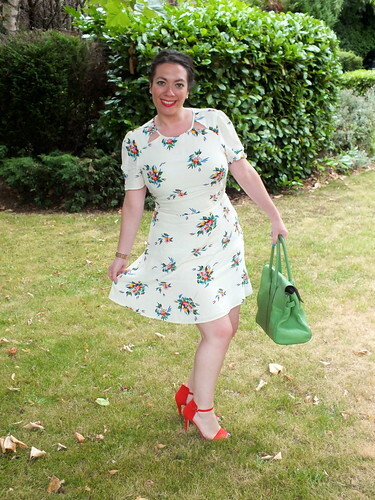 Whilst I had a mad dash to the party (running late as usual) it was only about 5 mins walk away and then I spent most of the day sitting in a chair eating and drinking so I didn’t expect to suffer too much from Primark’s strappy sandals – I was wrong. I tottered home and on removing the sandals each big toe had a small blister from the front strap rubbing which, baby I may be but was quite sore and now displays a pleasant scab. Not really what one wants when parading their tootsies in flipflops and sandals during Summer. But they do say no pain no gain and I do love them so but they will be restricted to occasions where no walking is required henceforth! I’m sure an elegant clutch would have complimented my outfit better but when one has their big camera and gift to carry the Mulberry Bayswater is the answer. That said I think when you have a bag in such a beautiful colour it’s right for any occasion surely? And my hair, well you’ll have to stay tuned to hear about my trip Hersheson’s blow dry bar! I adore the colour of your Bayswater! 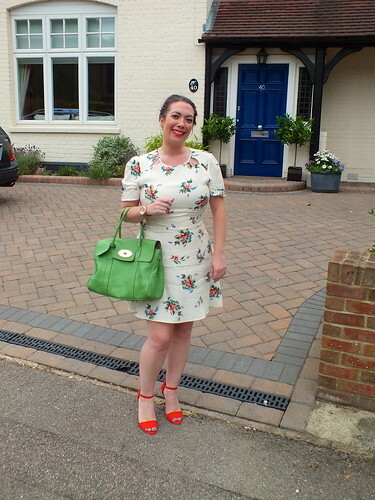 It's a lovely dress and your bag is the perfect green! One thing I've realised as I've got older is that more expensive shoes are usually more comfortable - that was never a consideration when I was younger! I have serious handbag envy - it's gorgeous!